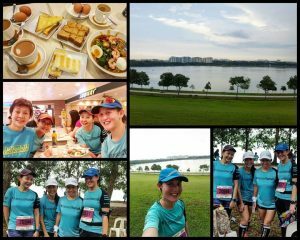 Race Review: The Performance Series 2016, Race 4, Bedok Reservoir [10 KM] (by Rebekah Ong) | JustRunLah! 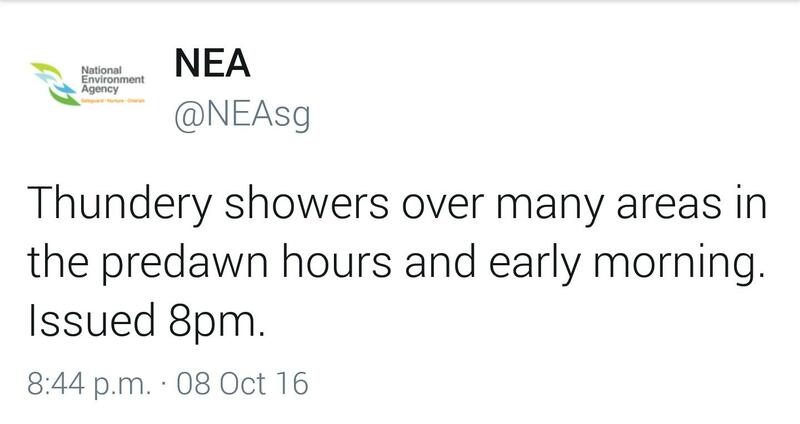 “Thundery showers in many areas in the pre-dawn hours and early morning”. I just decided to shake off the weather warning and go to bed so that I could get up early to catch the shuttle service to the race event site. I woke up at 04:45hrs on race day ensuring that I had enough time to prep and head out to catch the shuttle bus at 05:45hrs at the Yishun MRT station. At this point, the North was still pretty much fair and there was no signs of rain or any down pour. We boarded the shuttle bus and it was a really smooth 20 minutes ride to the race event site. When we arrived at the race event site, the weather was still holding up and the thought of rain didn’t cross my mind till I was queuing up to use the toilet. It was still very dark but far across the opposite end of the reservoir, you can see the sky turning red and starting to look threatening. We heard small booms of thunder which sounded far away and we were still very optimistic that it won’t rain. Slowly my phone started getting busy with messages from friends messaging me both on Whatsapp and Facebook telling me about the weather. 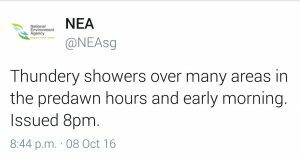 Some parts of Singapore had apparently started raining heavily. 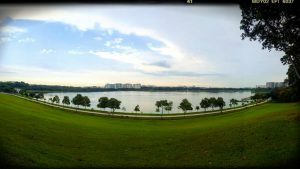 In a matter of minutes, the weather at Bedok Reservoir had just changed, there were strong winds blowing and it started to feel cold. We decided to take shelter near the toilet. There were many people crowding there. There was a slight drizzle but that quickly past and we thought it was going to be okay. 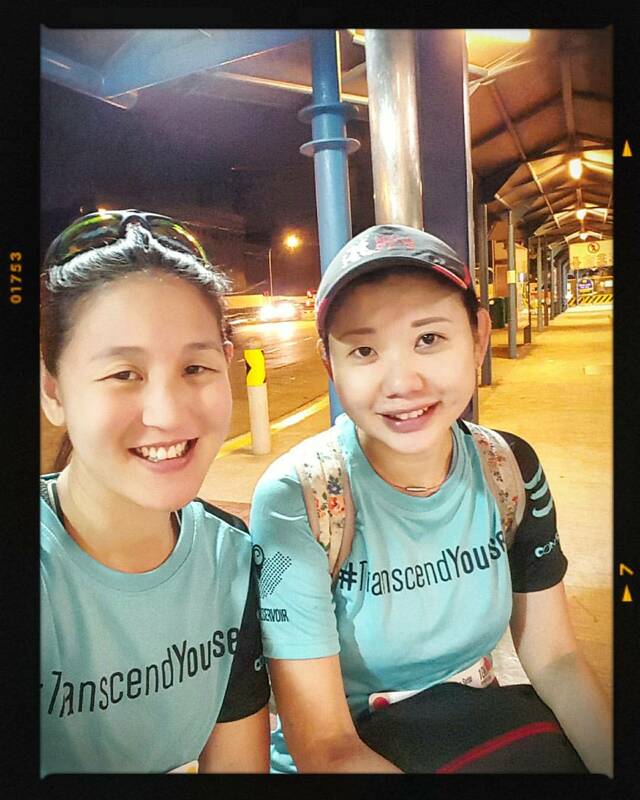 I decided to accompany my friend, Cheng Yee to the bag deposit counter to deposit her bag. Just as we reached the bag deposit counter, it started to pour, there were some participants already taking shelter at the bag deposit counter so we decided to follow and stay dry. The rain came down heavily and you could see participants frantically trying to find for shelter. There was an announcement being made saying that Wave 1 runners were being diverted and the race for that wave was cancelled. 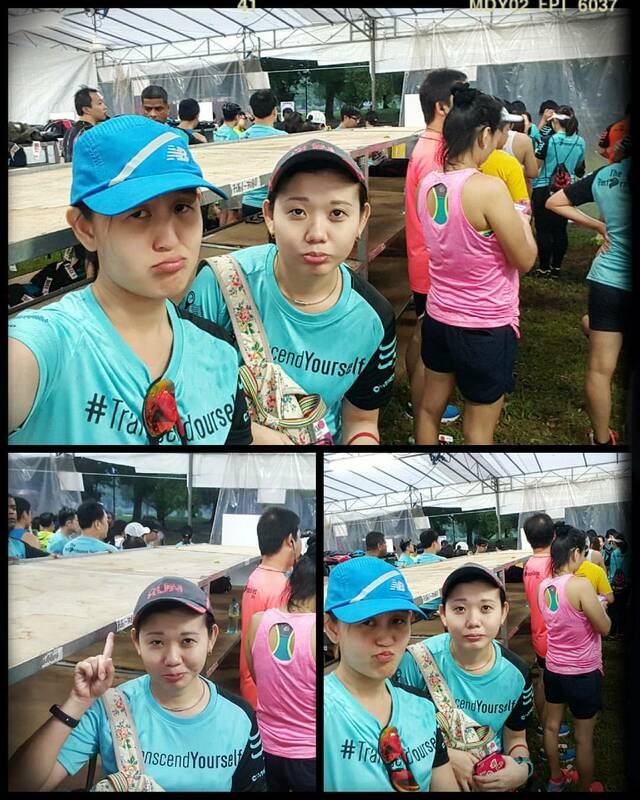 They advised participants to collect their medals and finisher tees. What a way to start off their Sunday being drenched in the rain. As for Wave 2 runners, the start time would be delayed pending further weather updates. We were stuck at the bag deposit area for about 20 minutes before the rain stopped. One of the crew members had came and informed us that Wave 2 would go ahead but with a delayed flag-off timing. We walked out of the bag deposit area and the weather seemed to be holding up. 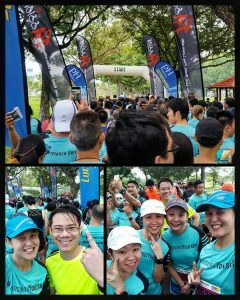 We went to find our friends for some photo taking and chit chat while waiting for announcement of the flag-off for Wave 2. 07:30hrs was the tentative flag-off timing for Wave 2 but it was further delayed to 08:00hrs. 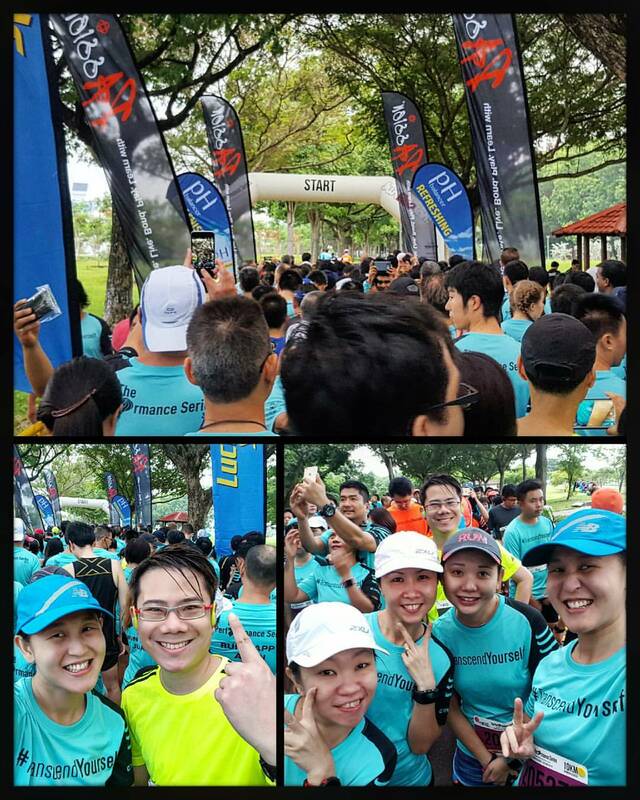 The start pen opened about 07:45hrs and the participants made their way there. The mood before race start was definitely not dampen by the wet weather! I could see that all the participants eager and excited to start! 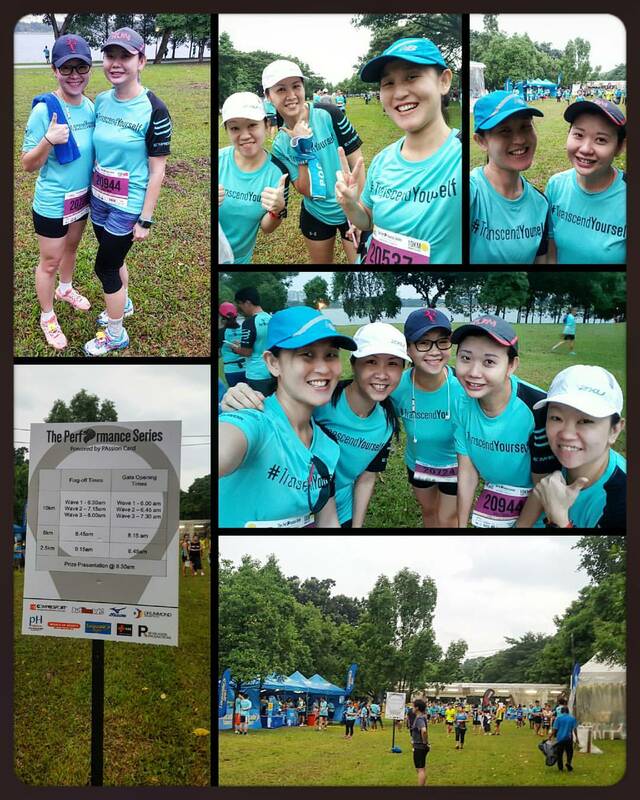 The final decision was to start Wave 2 and Wave 3 together and we were flagged off at exactly 08:00hrs. Though the flag-off was at 08:00hrs, it wasn’t warm. The rain had made it very cooling and it was definitely going to be a temperature to workout to. We were worried that there would be lots of bottle necks but it was pretty smooth running all the way from start to the end. As this was my first time running around Bedok Reservoir, my first impressions of the place was that it really similar to Jurong Lake. Beautiful sceneries, combination of paved and gravel roads along the route. 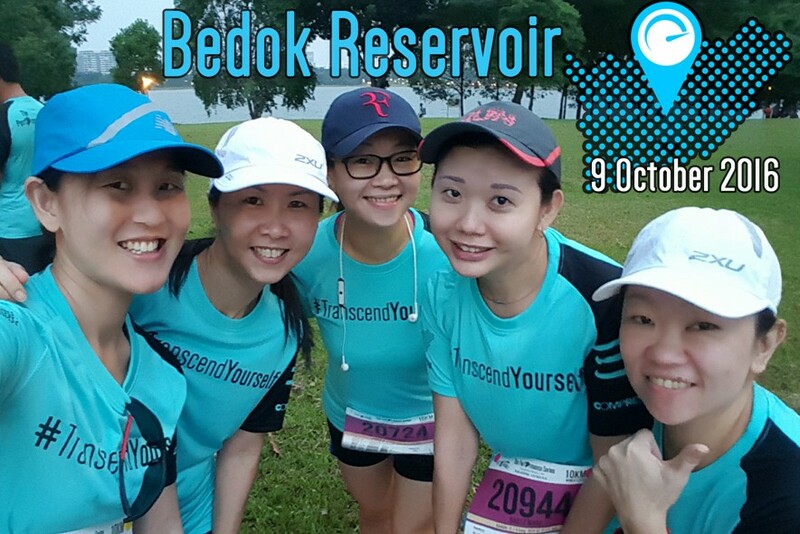 One main difference was the change in elevation, there were some challenging slopes around Bedok Reservoir and it was part of the 10km route. The most challenging one had to be around the 8km to 9km marks. I just decided that I would power up the hill and take a short breather at the top. 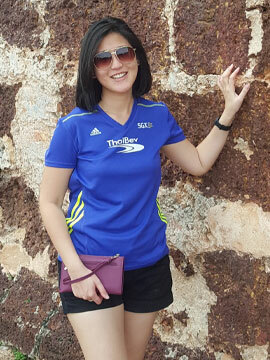 It was not easy but being at the top of the hill, I could see a beautiful view of the lake in the middle of the reservoir. 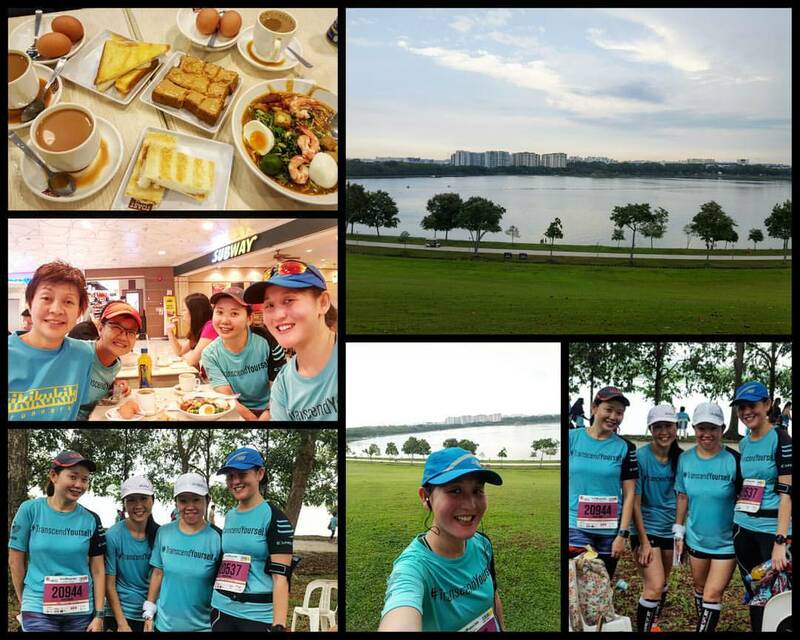 Once I caught my breathe, I quickly picked up my pace and headed for the finish line. As I crossed, the finish line, I was glad that the race did not get cancelled. I have to give it to the organisers! They made the right calls on a difficult situation and handled the bad weather conditions well. Everything was well planned from shuttle services at different locations to water points along the race routes, I really could not fault anything the organisers did. Kudos on a job well done! I’m definitely looking forward to the last and final race of the the series! At this point in time, the details of Race 5 are still not out. Can’t wait to complete that medal collection of mine! 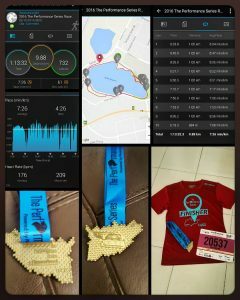 Till my next race review, here are some photos taken after the race. Have a great week everyone!